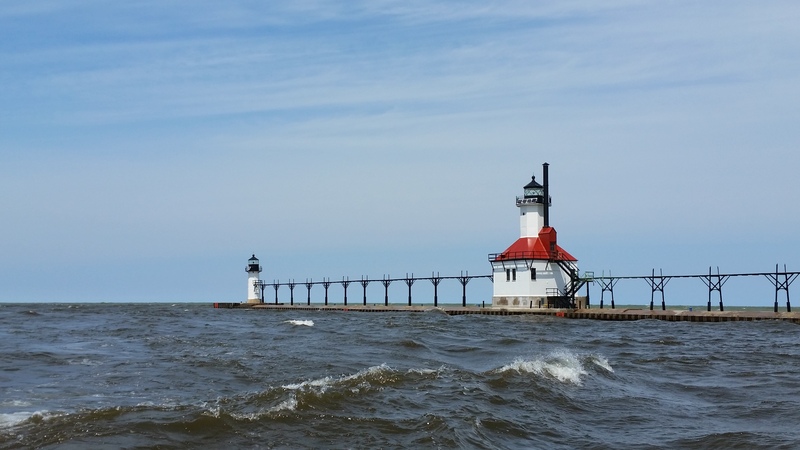 The St. Joseph Pier Lights have stood at the end of the city’s north pier since the early 1900s, guiding marine traffic in and out of the channel that joins Lake Michigan and the St. Joseph River. 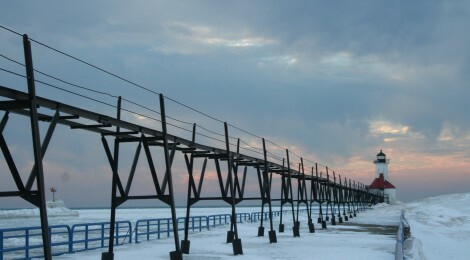 They’ve become an iconic symbol of a Lake Michigan town with a population of close to 8,300 over the years, and thanks to the efforts of local community members and volunteers they have been rehabilitated and will continue to stand proudly for many years to come. 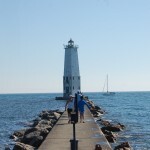 The lights’ location close to the popular beach at Tiscornia Park adds to their popularity and keeps the pier busy in the summer months. 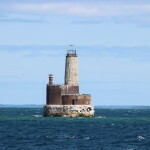 St. Joseph is home to many charter fishing operations that take trips out to try and land salmon, steelhead, trout, walleye and more. 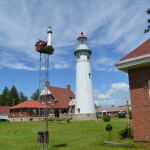 The outer light is a white conical steel plate tower capped with a black lantern room, it has a height of more than 30 feet. The inner light is easily recognized, with its square white base and angled red roof. An octagonal white tower rises out of that red roof and is capped with a black lantern room. Its stands more than 50 feet tall. 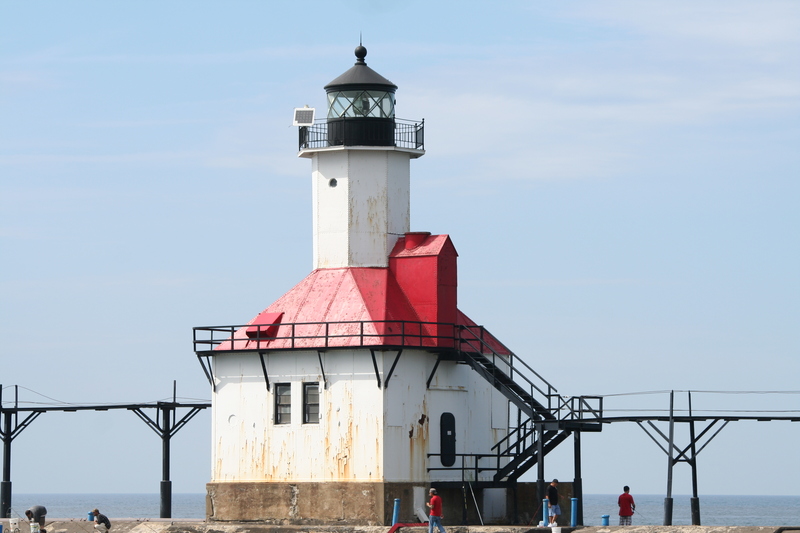 The Michigan City East Pierhead Light (Michigan City, Indiana) is very similar. This is one of only four Michigan lighthouses whose catwalks still remain (all are found on Lake Michigan) – South Haven Light, Manistee North Pierhead Light and Grand Haven Lighthouse (currently removed for pier replacement project) are the others. 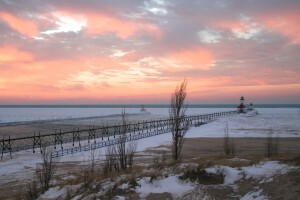 The St. Joseph Pier Lights were the Lake Michigan representative in the U.S. Postal Service’s 1995 Great Lakes Lighthouse 32 cent stamp set (along with Split Rock, MN (Lake Superior), Thirty Mile Point, NY (Lake Ontario), Marblehead, OH (Lake Erie) and Spectacle Reef, MI (Lake Huron). 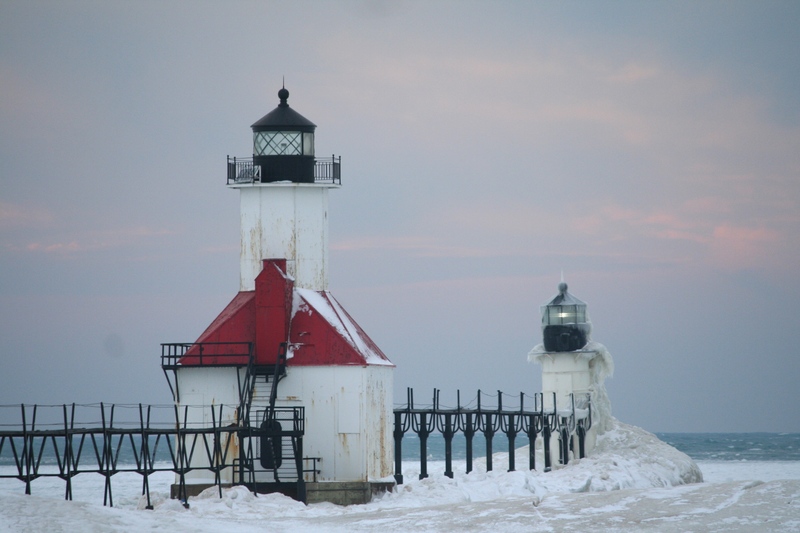 The St. Joseph Pier Lights are also a popular winter photography subject, with several images of the beacons encased in snow and ice going viral over the past few years. 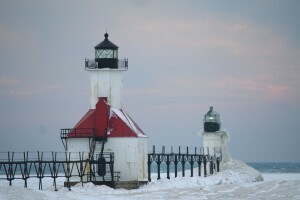 Photographer Joshua Nowicki has several galleries of amazing photos of these lighthouse at https://joshuanowicki.smugmug.com/. 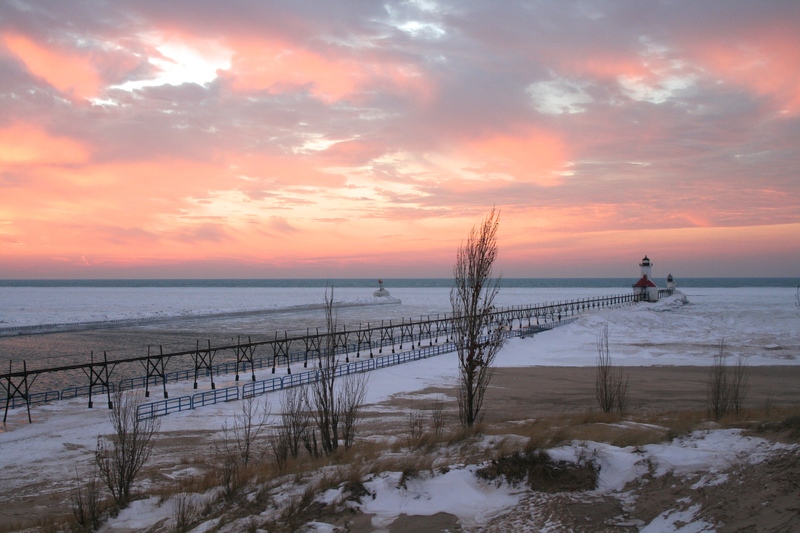 As is the case with nearly every Lake Michigan lighthouse, this is a great place to catch a summer sunset. 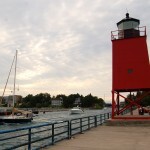 The pier lights were stops 41 and 42 on our Ultimate Michigan Lighthouse Road Trip: Lower Peninsula tour. 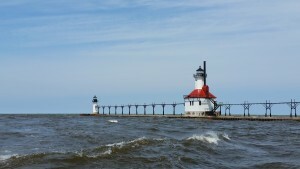 To get to Tiscornia Park from M-63 in downtown St. Joseph, head north and cross the river, turning west on Klock Rd. This road will become Upton Dr. When Upton meets Marina Dr. take a right on Marina and follow it to Ridgeway Dr. You can take Ridgeway to Tiscornia Park, which has plenty of parking for the beach and pier access. As always, use caution on piers and breakwaters and be aware of changing weather conditions.